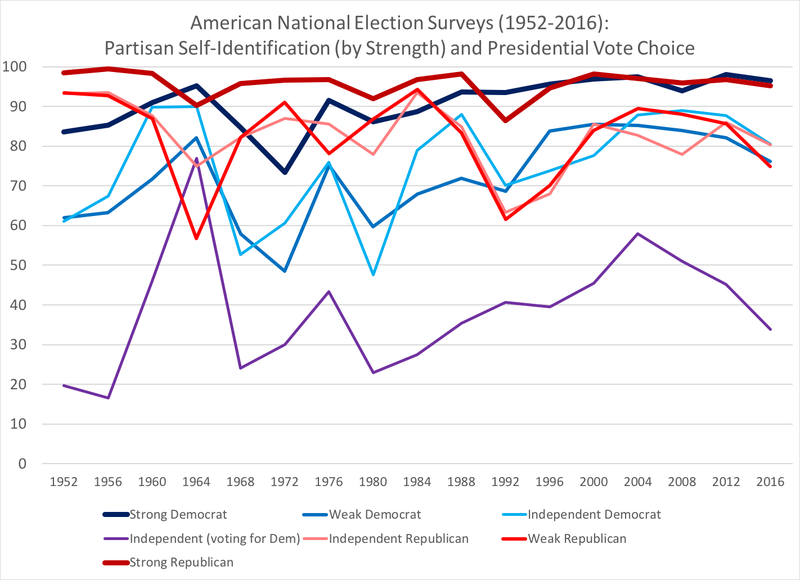 Much has been made about the role of partisanship in American politics: some call it "tribalism" in the sense that party loyalty drives most views and actions, especially when it comes to voting behavior at the presidential level. 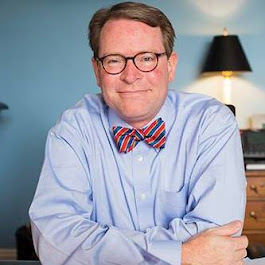 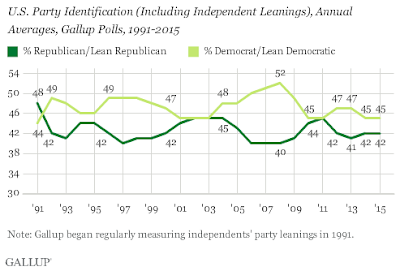 And while some believe that the "political independents" can save us (and point to rising numbers in polls that show "independents" are now the largest bloc of voters), the sense of party loyalty has been evident even among these 'faux' independents. 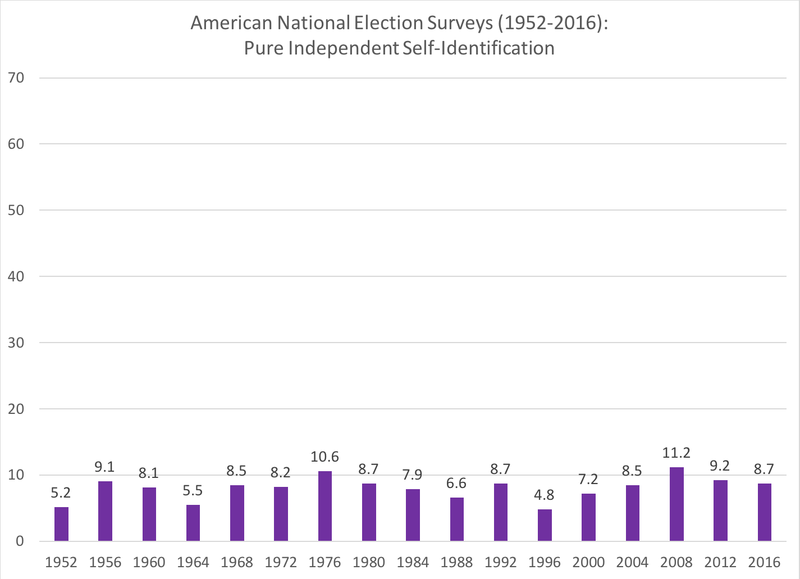 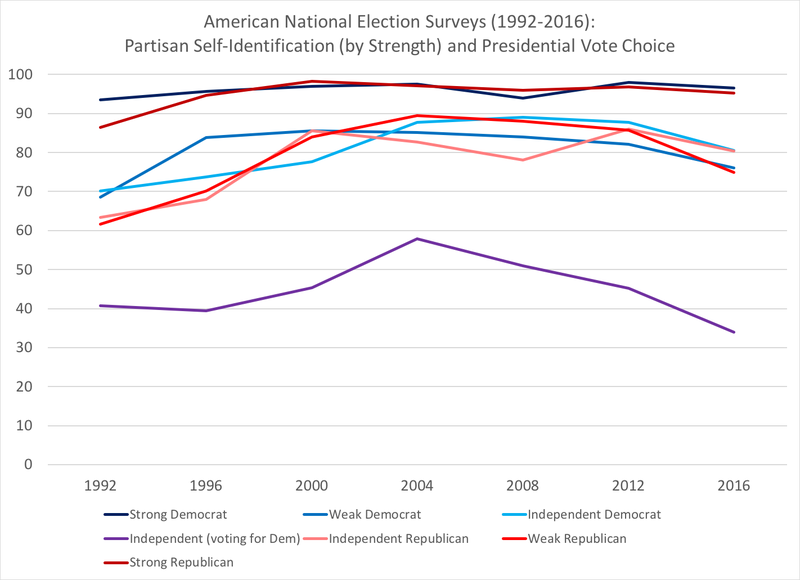 In looking at data from the American National Election Studies from 1952 to 2016, I wanted to get a better sense of how these trends--the perceived rise of independents, as well as the potential rise or decline of partisanship and party loyalty--has been recorded in presidential election years. 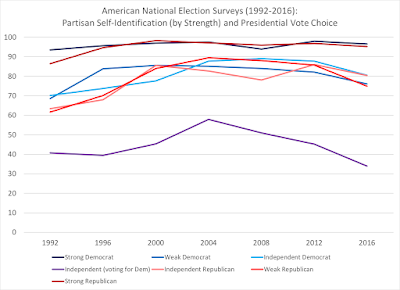 To garner a sense of the various electorates in presidential years, I first looked at the party identification, specifically including the "strength" of partisanship factor that is in the ANES data for the various years. For example, "strong" partisans (both Republicans and Democrats) could be compared to "weak/not very strong" partisan identifiers in both parties, while independents could be divided into "leaners" to one party over the other compared to "pure" independents. 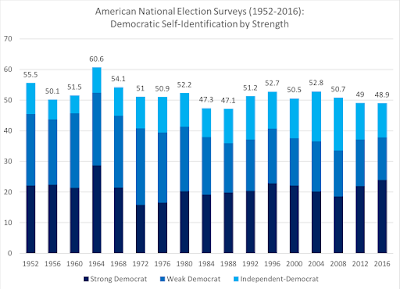 For example, in 2016's presidential election, the break-down of the electorate showed that strong partisans (either Democratic or Republican in allegiance) was a combined 43 percent of the electorate; add "not very strong" partisans to their strong adherents and well over over two-thirds of the electorate (68 percent) identified with one of the two major parties. 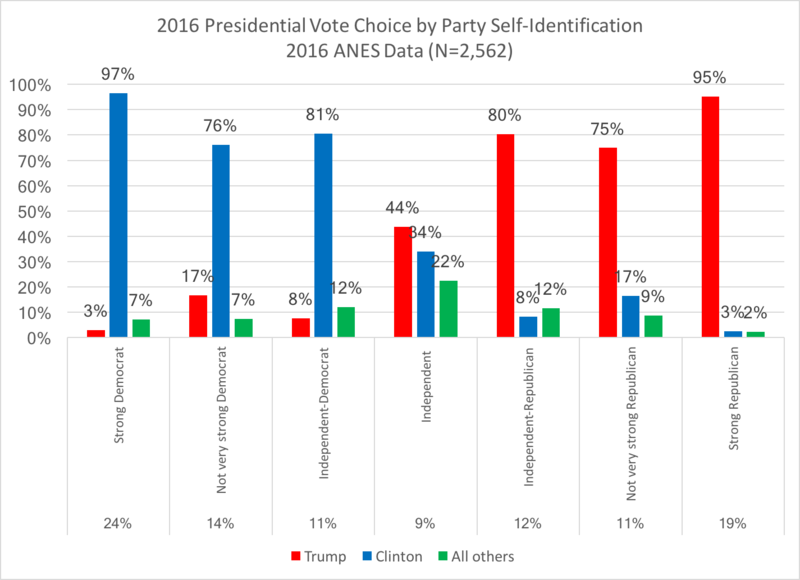 But in taking into account the remaining 32 percent of the electorate who identified as "independent," only 9 percent said that they were "pure" independents (didn't lean to either party), and they split their vote in a fascinating divide among the two major parties' presidential candidates and third party candidates. As for the "leaners" among those independents, 81 percent of the Democratic-leaning independents and 80 percent of the Republican-leaning independents voted for the party they leaned to in their presidential vote choice. 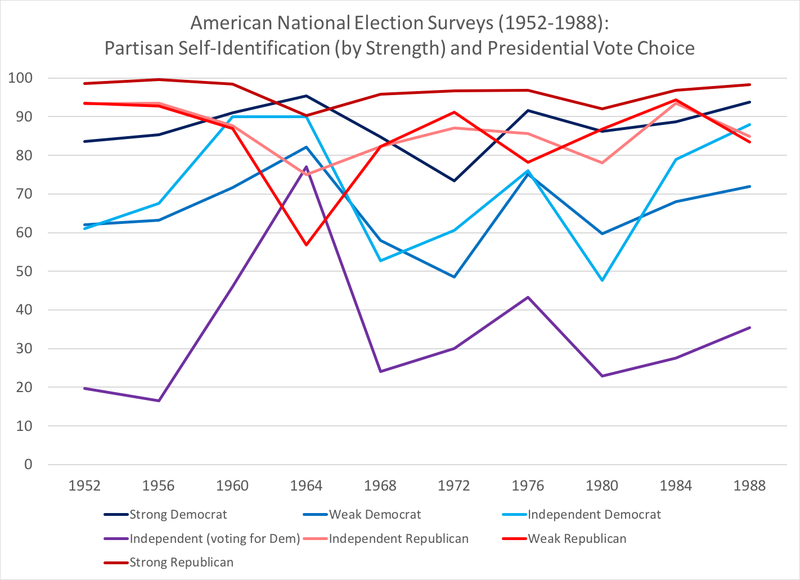 In fact, both groups voted at a higher rate for the leaned party than those "weak" partisans did. 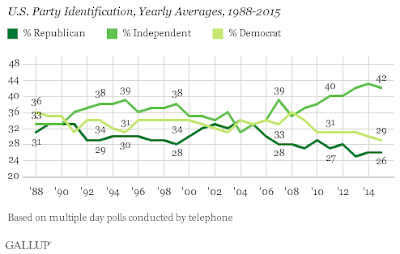 How exactly are these independent leaners "independent"? 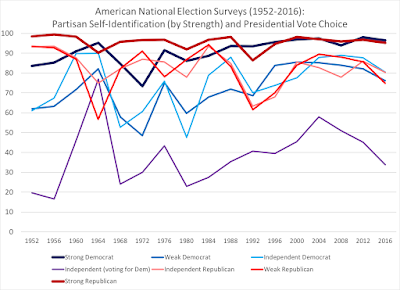 This trend has been noticeable over the past few presidential elections, but I wanted to go back (as far as ANES data would allow) to see what trends, if any, were in the past sixty years. 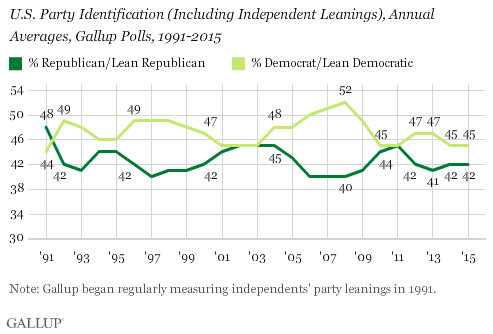 With their levels of partisan "loyalty" (voting for their leaning party's presidential candidate), partisan independents need to be differentiated from the "pure" independents. 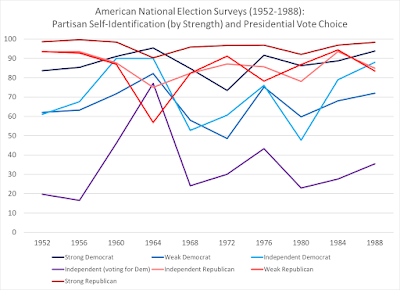 As the 1952-1988 chart shows, the dispersed levels of partisan loyalty is evident among many of the categories, particularly among Democrats (from strong to "not very strong" to independent leaners). 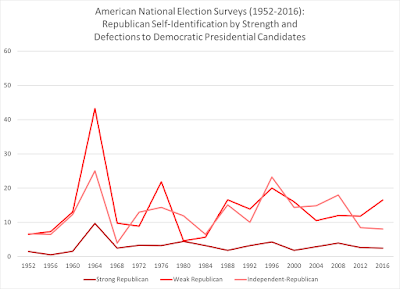 But once 1992's presidential election comes, the "dispersion" among the loyalties, especially "weak" and "independent leaners" for their parties seem to coalesce into a much cleaner trend line. 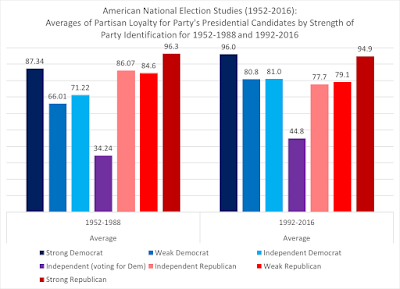 While partisan adherents show the greatest loyalty, the weak and lean partisans have tightened in their partisan loyalty since the Clinton-G.H.W. 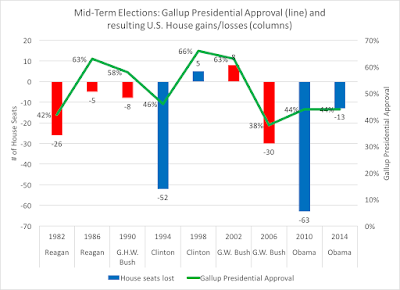 Bush-Perot contest. 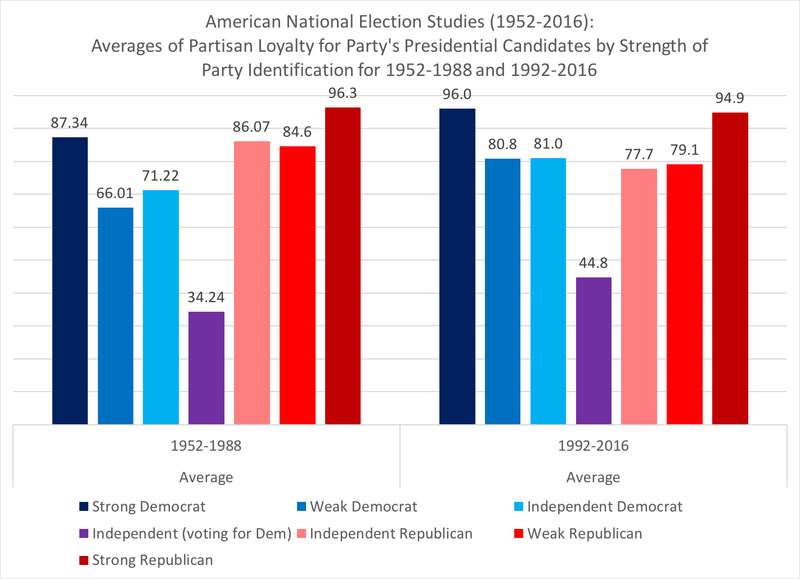 Strong Republicans have shown the greatest consistency in their party loyalty, average 95 percent of the time voting for their party's presidential candidate since 1952, while it was only after 1992 that strong Democrats showed their party loyalty at 96 percent from the previous period of 87 percent. 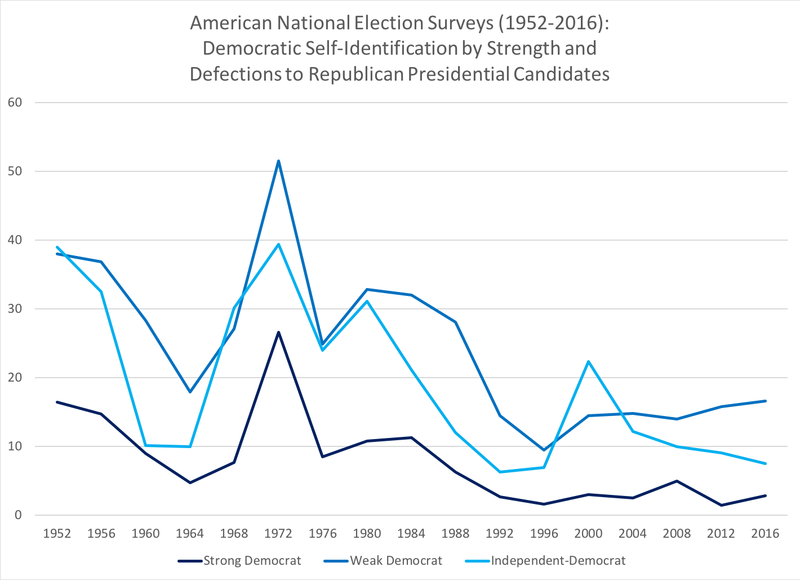 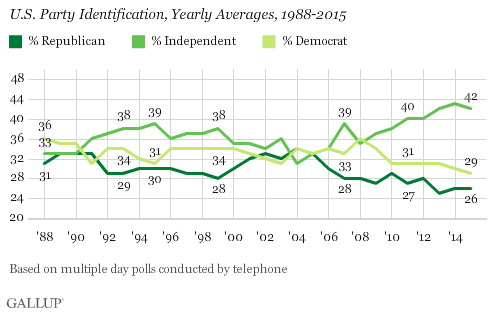 Another interesting phenomenon also appears to mark the two periods differently: before 1992, weak and independent-leaning Democrats were well below their Republican partisan brethren, but after 1992, weak and independent-leaning Democrats increased their partisan loyalty to comparable to Republicans, who slipped in their partisan loyalty. 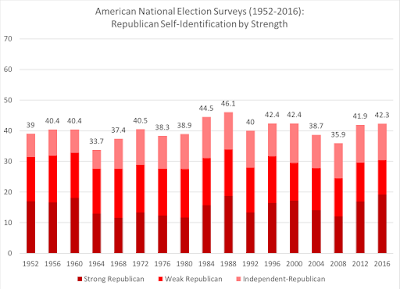 But make no doubt: three-quarters to 80 percent of 'partisan' identifiers (excluding strong partisans) are loyal to their party's presidential candidates. 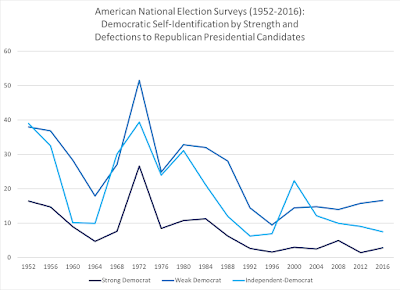 The greatest party defections come when notably "weak" presidential candidates secure the party's nomination: for Democrats, the 1972 spike in defecting to vote Republican was in response to George McGovern's candidacy, while the 1964 Republican spike was for Barry Goldwater's conservative insurgency. 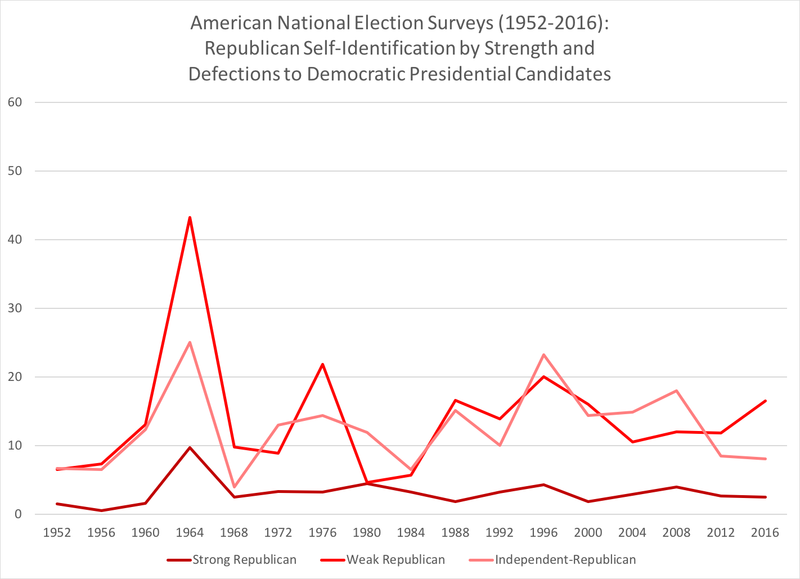 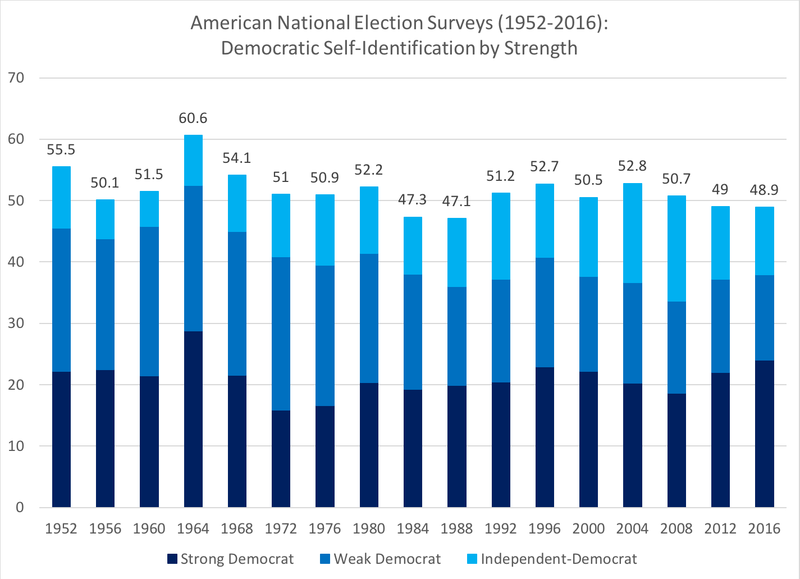 But since 1992, with two notably "smaller defection spikes" for both Republicans (in 1996) and Democrats (in 2000), less than 2 out of 10 partisan self-identifiers have broken with their party loyalty and voted for the opposition presidential candidate. 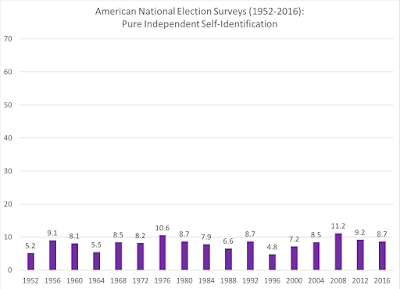 In other words: with only one out of ten presidential voters as the "pure" independents so many have been calling for, partisan tribalism and loyalty is the norm for voting behavior, and we shouldn't be surprised it influences other aspects of our political environment.